First, a little bit about myself. 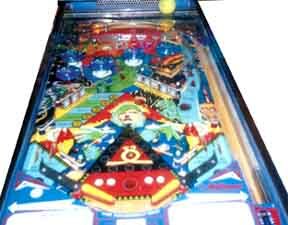 I am 25 years old and I like all pinball games especially the ones in the late seventies early eighties. I like those because they combine the playability of an electromechanical with solid-state excitement. My favorite machine ever is The Machine: Bride of Pinbot. 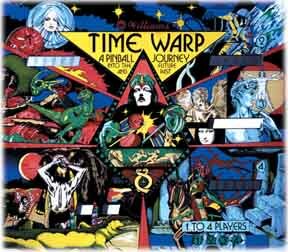 I only own Time Warp, and I collect Pinball related articles like flyers, books, and magazines more than I do pinball machines. 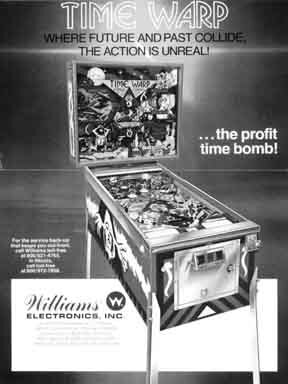 Time Warp, a pinball journey into the future and past, was made by Williams in September, 1979. It is one of the classics of early electronic games. The artwork was done by Constantino Mitchell and is very detailed and colorful. There is a great deal of well known art on the game including the Mona Lisa. The artwork on the backglass and playfield contains subjects ranging from dinosaurs to astronauts. The backglass is one of the prettiest I have ever seen. The cabinet art is great with what appears to be the face of an ancient druid. The real beauty of the game lies in the Barry Oursler designed playfield. The opening plunger shot can land in either a kick-out hole on the life side or three rollovers. The kick-out hole cycles between four different awards during the plunger shot. Once the ball hits something, the hole stops cycling and will change the award every time it or a drop target is hit. The awards are 5,000 points and an advance bonus; lites the bull's-eye target for 30,000 and 3 advance bonuses; advances the x value (x multiplies the bonus at the end, you can have 1x, 2x, 5x, and 10x); and lights the return lanes for 5,000 points. The rollovers score 1,000 points, increase the bonus by 1,000, and light up. If you get them when they are lit, they score 3,000 and increases the bonus by 3,000. If you get the A, B, and C rollovers completed twice, the bull's-eye is lit for the special. Then the ball reaches the five jet bumpers. They score 100 points usually and 1,000 points when lit. They provide the most action on the field and can easily rejuvenate a bad game or ball. A ball can stay up there for a while getting a great deal of points or can be ricocheted right between the flippers. Also, a skillful shot can send the ball through the bumpers and back to the top of the playfield. The bumpers are lit by hitting the five drop targets on the right side of the playfield. Each one of the targets corresponds to a jet bumper. When all five targets are hit, the bumpers become unlit. The five targets are worth 1,000 points each. When all of the targets are hit, the bonus multiplier increases and gives an extra 5,000 points. There is also a bank of three targets on the left side of the playfield. This allows for shots which hit the left bank and then the right bank knocking down four or five targets at a time. The left side targets score 1,000 points each. Each time you hit them, the points received for knocking down all three increases from 5,000 to 10,000 to 15,000 to 20,000 ending at 30,000. When it is hit for 30,000, the very top kick out hole is lit for an extra ball. An extra ball is a very hard thing to get in this game. Finally, there is a long lane adjacent to the shooting lane. This lane has the bull's-eye which, when hit, scores 10,000. If it is lit it scores 30,000. Then the ball moves to the kick out hole and the end of the lane. It awards any bonus you have and allows you to keep the bonus. The bonus, with a minimum of 1,000 points and a maximum of 120,000 points, may be the most satisfying part of the game. Playing with four people adds a lot to the experience of this great game. Especially when they stand there in awe for the long time it takes for a 120,000 point bonus to be collected.